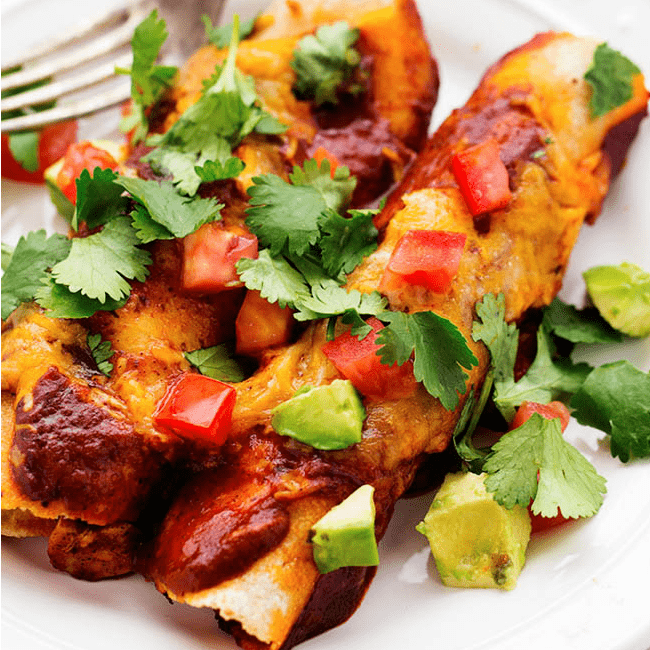 Chicken, homemade red enchilada sauce, and cheese combine with better for you ingredients. They are full of amazing flavor and you don't have to compromise on taste! In a medium skillet add vegetable oil, flour, and chili powder. Gradually stir in the tomato sauce, water, cumin, garlic powder, onion powder, and into the flour mixture. Reduce heat to low and cook until thickened, about 10 minutes. Preheat oven to 400 degrees. Reserve one cup of the enchilada sauce. Add the chicken to the sauce and assemble the enchiladas by adding ⅓ cup of the mixture in the center and roll the enchilada up and place seam down in a 9x13 inch pan. Top with reserved enchilada sauce and cheese. Bake for 20-25 minutes or until heated through and the cheese has melted. For nutrition information I recommend using myfitnesspal.com. This is a great resource for counting calories.